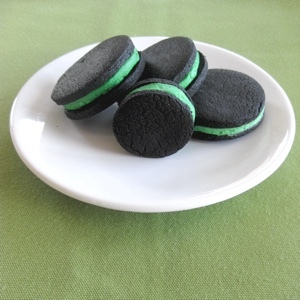 This year I decided to turn my standard homemade Oreos recipe into a St. Patrick's Day version by coloring the filling green. Which of course made me think of grasshopper mint ice cream, so I added a bit of peppermint to the mix as well! If you'd like to tweak the green or try a different color — say pastel pink, yellow, or blue for Easter — you can see this homemade food coloring chart. It's is the basis for the coloring in this recipe. I love this version of the cookie because it uses either sprouted or whole grain flours — whichever you prefer. I've made it with spelt, whole wheat, sprouted wheat, sprouted spelt, and even once with a bit of sprouted barley when I was running short on other flours. They all work well. The cookie part of this sandwich cookie is very dark and only slightly sweet. (In fact, you can further reduce the sugar by an additional 1/4 cup, if desired.) This is because the filling is very sweet, and to replicate store-bought Oreos as closely as possible, you want something to offset that sweetness. This dough is also on the edge of being crumbly, so don't despair if your dough begins to look not quite cookie dough-ish. The perfect dough is slightly crumbly, soft when pressed, quite smooth and coherent when pressed into a disc, and not sticky at all. You want a cookie that doesn't spread while baking and is crunchy when cooled. Since this dough uses black cocoa powder — which can be found on Amazon or at health/gourmet food stores — it is very dark and you'll need every ounce of your keen powers of observation to keep the cookies from burning. When they're done, the tops will be matte and dry instead of glossy. You shouldn't smell burning. Also, regular cocoa powder may be substituted, if necessary. In order to get the best crunch out of these cookies, let them cool for a minute or two on the baking sheet to firm up a bit, then move them to a cooling rack and leave them until fully cooled. If you want to press a design into them, definitely do it right away while they're still hot on the baking sheet. Perfect for St. Patrick's Day! If you'd like to tweak the green or try a different color — say pastel pink, yellow, or blue for Easter — you can see this homemade food coloring chart. It's is the basis for the coloring in this recipe. Makes 36 individual cookies or, with filling, 18 sandwich cookies. In a mixer, cream the butter and powdered sugar on high speed until light and fluffy. Add the cocoa, baking soda, salt, and chocolate extract and beat again until smooth. With the mixer on low, add half of the flour and mix until incorporated, then add additional flour until a not-at-all-sticky dough forms. Don't worry if it's a bit crumbly. Divide the dough into three discs, then refrigerate for at least 15 minutes and up to 24 hours to firm the dough. When ready to bake, set out two pieces of parchment paper. Work with each disc individually and keep the other discs in the fridge until needed. Roll each disc flat between the sheets of parchment paper until it is between 1/4-inch and 1/8-inch thick (about the thickness of two pennies). Cut out 2-inch round circles with a cookie cutter and place the cookies about one inch apart on a baking sheet lined with a silicone liner, parchment paper, or your favorite liner. Bake for 7 to 9 minutes until cookies appear dry on top, then let cool 2 to 3 minutes on the baking sheet before transferring to a cooling rack to cool completely. Place palm shortening and powdered sugar in the bowl of an electric mixer, then gradually bring the mixer up to high speed. Beat until fluffy, adding more powdered sugar a tablespoon at a time if necessary to firm the mixture. With the mixer on low, add in the homemade green food coloring and the peppermint oil a drop at a time, stirring until the mixture is homogenous, adding more color and flavor as desired. Use filling immediately or store in the refrigerator for up to 2 weeks. Bring the mixture fully to room temperature and remix if the colorant has seeped out of solution. To fill a cookie, invert one cookie, then place 1 tablespoon of filling on that cookie. Top with a second cookie and press lightly to bring filling just to the edges. Store cookies in an airtight container up to 1 week or in the freezer for up to 6 months. *See how to make your own powdered sugar. **Or other green food coloring, see other options. In order to get the best crunch out of these cookies, let them cool for a minute or two on the baking sheet to firm up a bit, then move them to a cooling rack and leave them until fully cooled. If you want to press a design into them, definitely do it right away while they're still hot on the baking sheet. Want more green goodness? 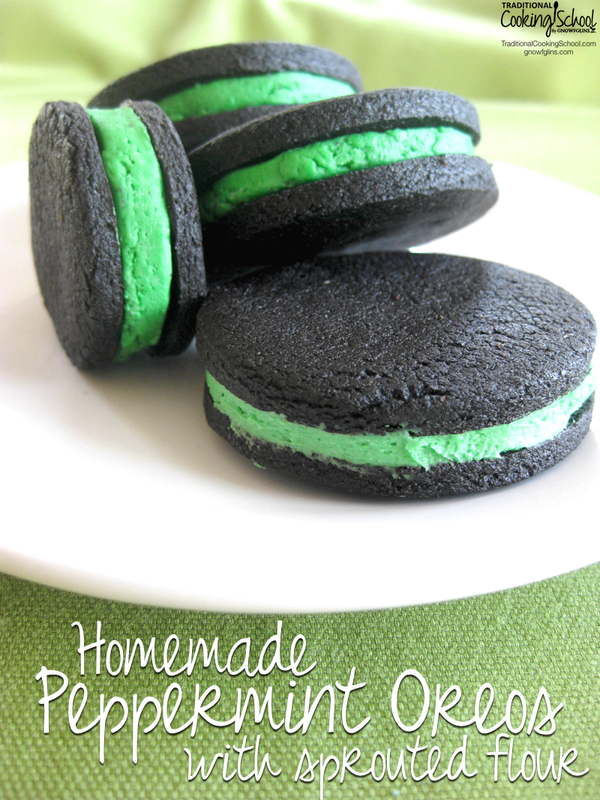 Check out these fun green recipes! What green foods or activities are you planning for St. Patrick's Day? These look great! I was wondering if you could replace the palm shortening with coconut oil? These look great and allergy free for my son! We have been eating less and less grains–could you sub coconut flour or almond flour for the sprouted flour?